Prior to moving to Iowa, Chris Dickhaus spent a decade building an active performance and teaching schedule throughout Dallas-Fort Worth. Around this time, Chris was a two-time MTNA National Chamber Music Competition finalist (2008-09) as part of the North Texas Saxophone Quartet, won first place at the North Carolina MTNA solo competition (2005), and second place at the MTNA southern region solo competition (2006). Chris holds performance degrees from the University of North Carolina at Greensboro, and the University of North Texas, having studied with Steven Stusek, and Eric Nestler, respectively. 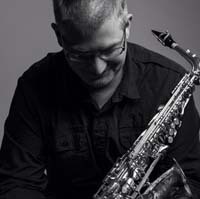 Currently residing in Cedar Falls, Chris joined the faculty at the University of Northern Iowa as the Adjunct Instructor of Saxophone in fall 2016, and, in addition, began his role as Adjunct Professor of Saxophone at Winona State University (MN) in fall 2017.